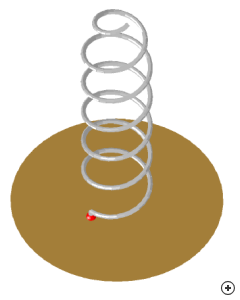 Image of the Axial-mode end-tapered helix. Helices with few turns perform well over a fairly wide band, with a bandwidth ratio of around 1.8:1. However, long helices have a reduced upper operating frequency. 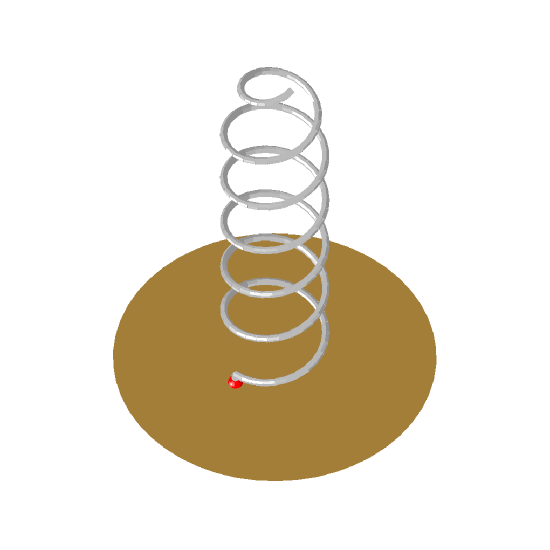 Varying the diameter of the helix can be used to widen the bandwidth and improve radiation characteristics, e.g. adding an extra two-turn end taper at the end of the helix can reduce |S11| over a wide frequency band and improve the axial ratio. This can also be achieved without increasing the length of the antenna by the use of a planar terminating Archimedes spiral of about 2 turns [Baker, D.E.]. The former approach is used for the design carried out by Antenna Magus. The design carried out by Antenna Magus makes use of the former approach, adding a linear taper at the end of the helix while maintaining the turns spacing.